Turn those empty prescription medicine bottles into Christmas snowman ornaments for your Christmas tree. 1. If you are working with small cotton balls to form the snowman’s body, as we did, then you will need to gently pull each cotton ball apart to separate the fibers a little. In the second row of our “supplies” photo, above, you can see a small cotton ball on the left, then a small cotton ball pulled apart, in the middle. The larger white pom pom on the right is used for the head. 2. Combine the cotton balls that you have just pulled apart by gently rubbing them together to form small rectangular strips of cotton batting, as shown in rows three and four of our photo. Alternatively, you can cut small rectangles of quilt batting. Each rectangle should fit halfway up the medicine bottle and all the way around it. 3. Glue the first rectangle in place around the bottom of the medicine bottle. Repeat with the second rectangle, covering the top of the medicine bottle, butting both rectangles together in the middle. 4. Center the smaller bottle lid on top of the medicine bottle lid and glue in place. Let dry, then paint both lids in black acrylic paint to make the hat. Set the hat aside to dry. 5. Glue the orange triangle nose in place, in the center of the pom pom head. 6. Glue two google eyes, or bead eyes, just above the orange nose, placing the eyes quite close together. 7. Use a toothpick to spread a thin bead of tacky glue in a smile shape just below the nose. While the toothpick is still slightly tacky with glue, use it to pick up each of the seed beads and set them in place, one by one, to shape the smile. You will find that you can move the beads around quite a bit to shape the smile in the way that you like. Once the beads are in position, let them dry in place. 8. Apply glue all around the top of the medicine bottle and set the head in place. Allow to dry. 9. Apply glue to the bottom of the snowman’s hat. Set it in place on top of the head and let dry. 10. 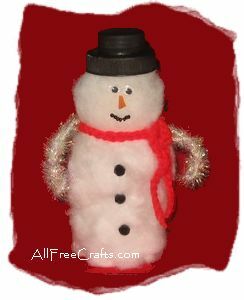 Bend over 2″ of the chenille stem and twist it back around the main length of the stem to form one of the snowman’s arms. Repeat at the other end of the stem. Curve the remaining middle section of chenille stem around the neck of the snowman, gluing in place at the back only. Bend the arms to achieve the look that you like. 11. Tie a small length of red yarn, or a small strip of ribbon or other ribbon, around the snowman’s neck as a scarf. 12. Finally, glue three black beads down the front of the snowman as buttons.